Mike Pence is very close with his mom, Nancy, née Cawley. Cawley can be a Jewish name. Mike Pence's Jewish relatives include Jesse Socher (above) and his son. 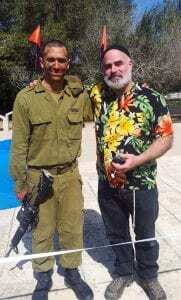 The son is wearing an IDF uniform. Mike Pence has lots of Orthodox, Jewish, Israeli cousins. Mike Pence's Orthodox, Jewish, Israeli cousins. One of Mike Pence's Orthodox Jewish relatives lives in the Golan Heights. 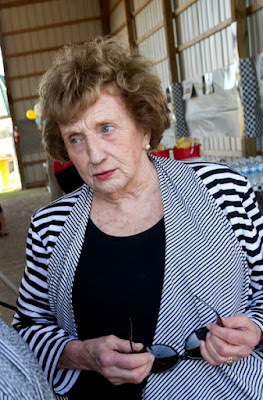 Tamsen Socher, a Jewish grandmother from Los Angeles, has a relative called Richard Pence, an amateur genealogist. Richard Pence has said that Mike Pence is Socher's cousin on her father's side. Socher says: "'Pence' was one of those made-up Ellis Island names, so we are all connected. I haven't met a 'Pence' yet who wasn’t a relative." Tammy's cousin Merrill Socher-Axelrod has personally told Mike Pence: "You have Orthodox Jewish cousins in Israel... Your cousins are my cousins." 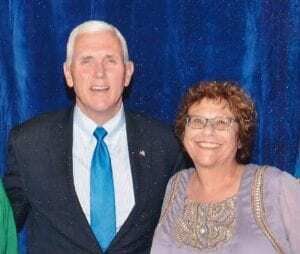 According to Tammy, several of Mike Pence's relatives are religious Jews, and at least one lives in Israel. 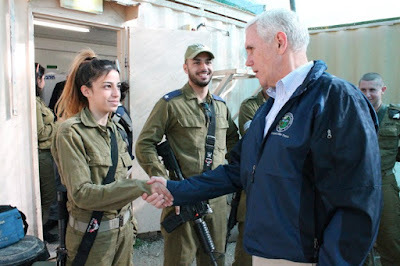 Pence and his Israeli friends. 1. The crypto-Jew Donald Trump becomes President but is then sacked. 2. 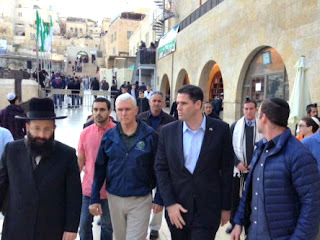 The crypto-Jew Mike Pence is thus able to become President. In the 1940, Franklin Roosevelt - arguably a war criminal who oversaw financing of the Nazis and the baiting of Japan into WW2 - Roosevelt picked pro-Russian socialist Henry Wallace as his vice-president, and lived through the term. "Nothing happens in politics by chance. If it happened it was planned" FDR Trump was pre-planned: Donald Trump's uncle John weaponized Tesla Weapons for the US Army during WWII; 60 years ago Walter Trump beating his Drum (Trump is anglicized Drumpf, Ashkenazi fake Jew "Drummer") offering protection by building a Wall in "Trackdown"; Heavy Metal Magazine featured Donald Trump's Wall building in the 1980's. Trump was portrayed as Biff in the "Back to the Future" franchise which predicted 9/11 and blaming Muslims in detail. Reagan met Donald Trump remarking "I felt like I was the one shaking the hand of the President". Trump's ghost written book "Art of the Deal" foretold his "Deal of the Century" in Israel. Like Trump, Pence was also pre-planned: Trump is the 44th man selected US President for the same reasons Israel had 44 Kings; Zedekiah did Evil in Sight of the LORD just as Trump does; C Alan Martin predicted the US would have 44 Presidents in 1971. The pre-innaugural party at the Lincoln Memorial (16th President=4X4; Tarot Card #16 Tower Card represents self destruction; Trump's 66th floor Penthouse is a shrine to Apollo "Destroyer" aka Abbadan/Apollyon in Rev 9:11. Why do you say Trump is the 44th selected president and not 45th? Who is the non-selected president not included in the count? In response to Brabantian, there is some contetion on whether FDR died of natural causes as we are all told or he was quietly silenced before his time. Lightly mentioned here: https://ersjdamoo.wordpress.com/2014/01/13/strange-death-of-fdr/ but also in the 1947 short book, " “The Roosevelt Death: A Super Mystery (1947)” the PDF can be easily found. We should all forget politics and take up embroidery. SYRIA FALSE FLAG, LEADING TO WAR? CLASSIC TOOL OF THE KOSHER NOSTRA - THERESA MAY? ISRAEL HAS SOLD USA TO CHINA? WOODWARD PART OF PENCE PLOT? GREATER ISRAEL INCLUDES THE USA.